Note: There is a simple on/off switch on the bottom, please pull out the insulative plastic sheet and press the switch when using. Note: To activate this glowstick, please gently bend and shake it for a bright and brilliant glow. Perfect party kits: Blu7ive new glow combination has more favorable FBA Rates which save money for your party; 2 kinds of glowstick emit vibrant bright, driving the party go into full swing. 12pcs LED Light-up foam sticks: Blu7ive reusable foam sticks, with 3 replaceable batteries, have the switch button to change 3 RGB modes ( slow, fast, flashing) and turn on/off, which can long last over 8 hours. 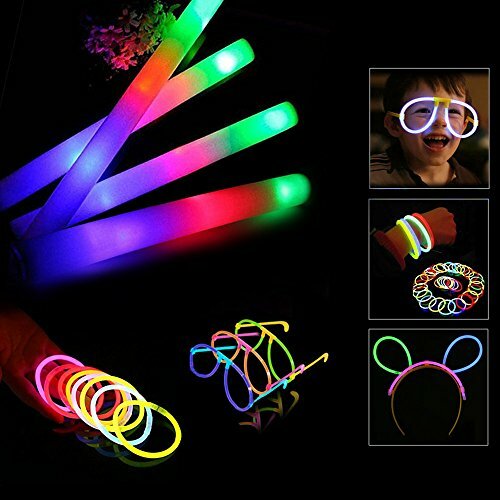 30pcs glow sticks: Blu7ive glowsticks can make glow bracelets, glow necklaces, glow eyeglasses, glow bunny ear headbands & other glow in the dark light up toys. And the waterproof, nontoxic lumisticks can light up your night long lasting 8+ hours. The Saftest Gift for Kids Age 3+: Due to the softness, kids can sword fight all they want and nobody will get hurt. LED Light sticks bring tons of fun for children and adults. It would be perfect for concert, wedding, birthday, clubs, sporting events, nightlife, raves, festivals, prom, bachelor parties, family reunion, camping trip and any other night time event. High Quality Assurance: All Blu7ive products are subject to strict inspection before shipment. The foamsticks and glowsticks will be worked flawlessly. Full refund AND resend another new package to you if there have more than 3 do not work. If you have any questions about this product by Blu7ive, contact us by completing and submitting the form below. If you are looking for a specif part number, please include it with your message.